Two recent actions shared center stage in Buenos Aires’ famous Plaza de Mayo, both made by groups of women, who in the choice of their actions, became walking witnesses against violence and injustice to women today and to all those who were disappeared during Argentina’s Dirty War (1976-1983). One year into that tragic period, it was ordinary women, housewives many, committed to being the center of their families—courageous women who took to the Plaza each week, walking together in silent protest against the dictatorship government’s actions of disappearing the young and political “dissidents” to their dictatorial rule. The mothers walked to plead for the return of their loved ones. During these years more than 30,000 people were “disappeared”, including infants and young children stolen from their parents to become the children of military families, university student activists who were kidnapped, disappeared, tortured and later murdered by being dropped into the Rio de la Plata during the night. The mothers’ silent walk demanded the government take action to find the disappeared. Every Thursday afternoon since their first march in April, 1977 the Mothers and the Grandmothers of the Disappeared have marched in silence in the Plaza. They are powerful in the presence, in their advocacy, in their continued political actions over the years, and in their silence, each Thursday afternoon, giving witness to the brutal injustices the government brought upon those who resisted them. Their story has been told by award-winning director Estela Bravo in a film, Who Am I?, and in print, Searching for Life: The Grandmothers of the Plaza de Mayo and the Disappeared Children of Argentina by Rita Arditti. On the particular Thursday I took these photos, the Mothers shared the Plaza space with another group of women, the Encuentro de las Trabajadores Bancarias, a professional organization of Women in Banking, during their 9th annual conference. The conference participants displayed their own silent witness in a public art action protesting injustice towards women, a “march” of multiple pairs of bright red women’s shoes. 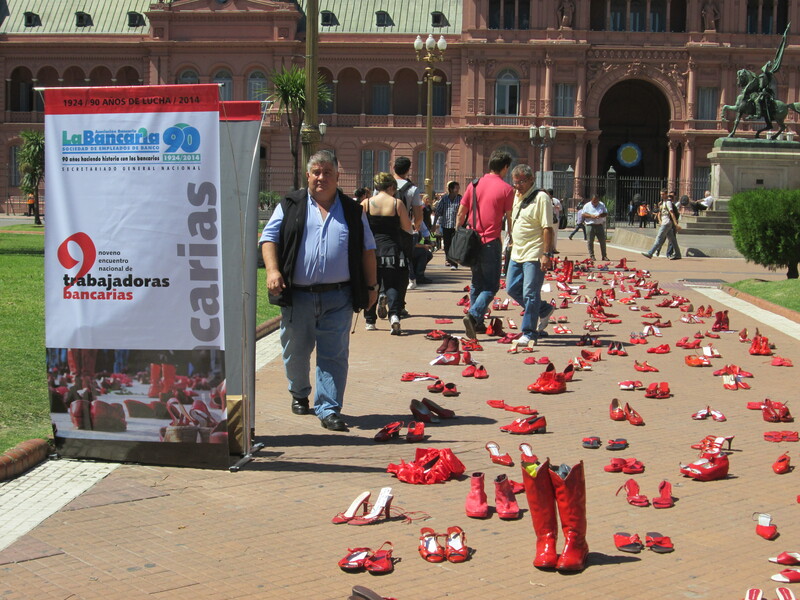 The red shoes formed a walking path, a silent presence and protest there, as did the mothers, in view of the Casa Rosada, the seat of the national government encouraging the government and the world, in their search for justice. It was powerfully moving to join alongside these two groups of women, with their powerful red and white symbols, marching for justice in Buenos Aires and around the world. We are blessed when we show such courage and an inspiration to all of us who at times doubt our strength. Thanks for sharing and educating me. Thanks for writing Rita. Un abrazo! Very moving and nicely done. Shoes are a powerful symbol, in this case inviting us to walk in another’s shoes. Thanks, Di! Thanks Martha. I first learned about las madres from Rita Arditti when I was in grad school. She wrote about the grandmothers and showed a film of them marching in the Plaza de Mayo. Who’d imagine I would walk alongside them today? Congrats on the book. I haven’t seen it but expect it is excellent!